The map of relevant risk in relation to age is an excel file consisting of 7 sheets. It is a very useful tool to analyze single tasks and correspondent age-relevant risks. The tool is inspired by suggestions found in INRS checklist. 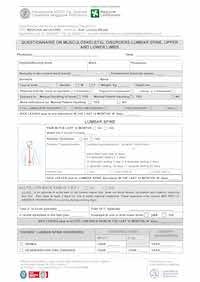 A Specific WMSDs questionnaire with a structured patient case history provides information on diagnosed disorders and pathologies affecting the three “main target areas” in manual patient handling risk: lumbar spine, shoulder and knee. This questionnaire proposes a homogeneous classification of WMSDs and pathologies that are relevant to MPH risk.